Senate Bill 179, “David’s Law” expanded authority to school districts, allowing schools to address cyberbullying off-campus and outside school-related or school-sponsored activities based on specific criteria. 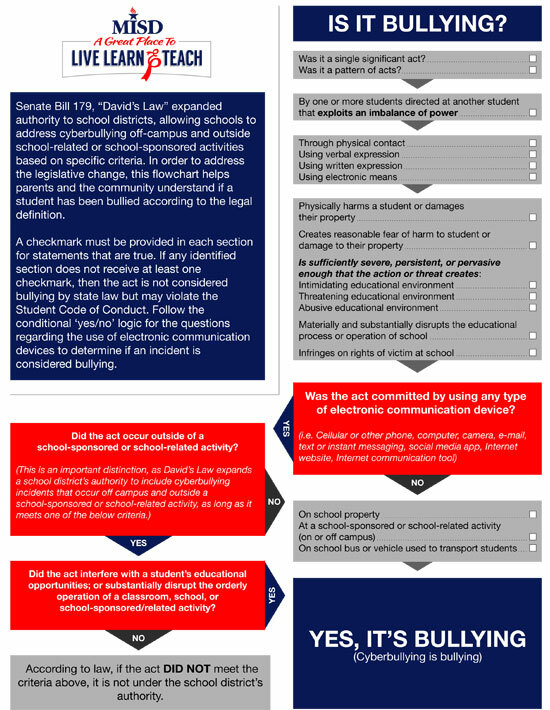 In order to address the legislative change, the following bullying flowchart helps parents and the community understand if a student has been bullied according to the legal definition. A checkmark must be provided in each section for statements that are true. If any identified section does not receive at least one checkmark, then the act is not considered bullying by state law but may violate the Student Code of Conduct. Follow the conditional ‘yes/no’ logic for the questions regarding the use of electronic communication devices to determine if an incident is considered bullying. To report an incident of bullying, a parent or student may complete the Parent/Student Bullying Report form and submit it to their campus administrator or report an incident of bullying through Crime Stoppers.